If you're a fan of what we in America call “Chinese food”, then you are at least aware of a dish called General Tso's Chicken. 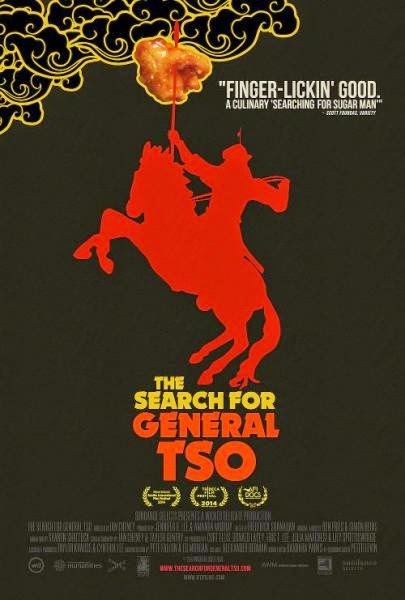 There's a fairly good chance you've eaten it, too, since it's one of the most popular ethnic foods in this country, just behind pizza according to one subject interviewed in the new documentary THE SEARCH FOR GENERAL TSO. But just who was General Tso and what, if anything, did he have to do with the dish that bears his name? Those are the questions writer/director Ian Cheney sets out to answer with his film. Given the premise, it's no surprise that SEARCH is pretty light weight fare. A cheap Chinese food analogy about being hungry again an hour after its over suggests itself. But given how so many docs these days go to the other extreme, dealing with BIG ISSUES with pronounced slants from one side of the political spectrum or another, a pleasant little diversion that shows the ways that food, history, and culture intermingle and evolve is kind of a nice change of pace. The film does touch on some weightier issues of racism in America, but its chief concern is to entertain and offer up a positive message of how thoroughly Chinese culture has been assimilated into and altered by America. 2 ½ out of 4 stars.